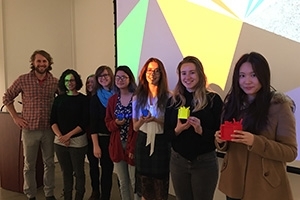 The Studio Art Program hosted the first annual Pam June Naik Video Art Festival at the American University Museum. The festival showcased work created in the past three years by 37 American University current students and alumni from the College of Arts and Sciences and the School of Communication. The festival was created in the spirit of Korean-American artist and video art founder Nam June Paik. Paik’s work has appeared in major art exhibitions including Documenta 6 and 8, the São Paulo Biennale, the Venice Biennale, and the Whitney Biennial. In addition, several public collections hold work by Paik including the Smithsonian American Art Museum. A majority of the festival’s participants were introduced to contemporary video art at AU in the Artist Perspective: Video Art course. The class is typically offered each term and is often taught by Wowsugi. The first place winner, Boyuan Han (BA studio art ’18), was one of Wowsugi’s students last semester. “It was my first video art class. I really learned a lot from Professor Wowsugi,” Han said. The festival led to other good things for Han. Winners of the festival were selected by faculty jurors Nancy Daly, adjunct professorial lecturer, School of Communication; Annette Isham, adjunct professorial lecturer, Department of Art; Kim Llerena, instructor, School of Communication; Patrick McDonough, adjunct professorial lecturer, Department of Art; and Naoko Wowsugi, professorial lecturer, Department of Art.